The Mission of the Cathedral City High School Bands is to provide the student musicians who comprise the Cathedral City High School Band Program with a balanced, and well-rounded music education. To that end, the Cathedral City High School Bands aim to provide all participating students with the fundamental, historical, theoretical, and musical knowledge to allow them to progress and delve further into the study of music both at Cathedral City High School and beyond. Furthermore, the Cathedral City High School Bands aim to provide students with positive, life-changing experiences that will serve to broaden their education, and allow them to personally experience new and unique performance opportunities, cultures, and repertoire. The Cathedral City High School Bands believe in the expectation of musical excellence. Thusly, the Bands of Cathedral City High School aim to mold students to understand and fully realize their own potential for excellence. Using music as the teaching medium, CCHS Band students will be taught discipline, citizenship, teamwork, goal-setting and fulfillment, work-ethic, musicality, and to realize their own skills and talents through individual and collective challenge. Students in the Cathedral City High School Band Program will be positive representatives of Cathedral City High School, and Cathedral City proper; students will learn first-hand the strength that diversity of culture, thought, and ethnicity can bring to an organization. As a musical organization, the Cathedral City High School Bands will provide all students with quality, level –appropriate literature. 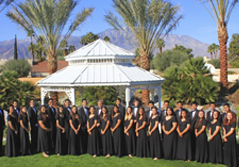 With musical excellence as the foundation, the Bands of Cathedral City High School will perform in concert with musicality; and students will develop a passion for music as a basis for all that the bands endeavor to rehearse and present. Students will be challenged to emote, and to discuss their experience with music through verbal discourse and the written word. Lastly, all students in the Cathedral City High School Bands will find an environment that enables successful learning to take place with an emphasis on Excellence, Service, Family, and Legacy.